Museum studies is especially valuable as a unique combination of the liberal arts and practical experience in a career growth area. Fostering a multidisciplinary approach is particularly important for museum and archives professionals in the areas of preservation technology, collections management, and exhibit development. 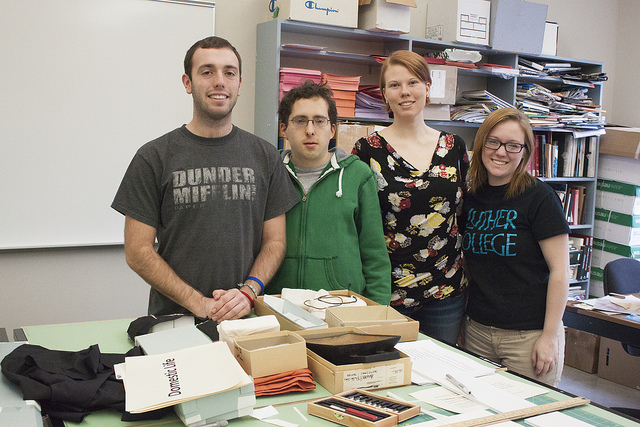 Museum Studies students have the opportunity to undertake projects on campus, in the local community, and with museums under the supervision of museum studies faculty and museum professionals. Student projects may be conducted as an individual or group assignment in the core museum studies courses, as well as in elective courses in history, art, education, and anthropology. 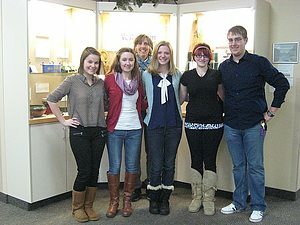 It is common for student experience in class projects to develop into internships, new research, volunteer or work study opportunities with Luther Collections and Decorah museums. Emily started her collections project at the Porter House Museum as part of the MUST 220 class on Collections Management. Her first project was to digitize a series of mixed media scrapbooks covering Bert Porter’s two major butterfly collecting expeditions in the early 1900s. She then began volunteering as a docent, giving tours to visitors throughout the summer on her off-days from her internship at the Vesterheim. 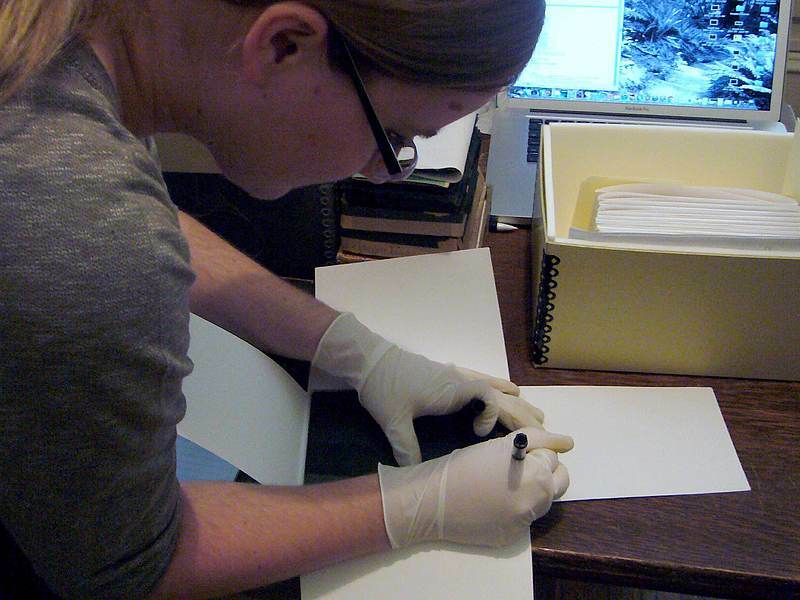 Once the Porter House Museum closed for the season, Emily began a project of inventorying, cataloging, and rehousing Bert Porter’s photography collection, focusing on the glass negatives and glass lantern slides from the early 1900s. She presented her projects at a public lecture at the museum in February 2015. Olin Exhibit "Things Matter: Exploring Material Culture in East Asia"
During the HIST 361 class taught by Professor Xiaolin Duan, students spent the semester studying the importance of material culture in East Asia. They explored everyday material culture in the history of China and Japan, starting with a general discussion of material culture with a wide range of physical objects (e.g. clothes, tea, architecture, religious objects, book printing, and artifacts). They analyzed both textual and visual sources in order to recreate a comprehensive picture of everyday life through objects. They also examined how material culture of different time periods evolved in response to various historical forces. Within the context of material culture and the nature of consumption, this course also explored overarching themes such as urbanization, transnational communication, and modernization. In this exhibition, each student selected objects from the Luther College Anthropology and Fine Arts Collections that represent the main themes of this class, and they are arranged from religious to secular based on their functions or how they are valued by their culture. The display was available from December 2014 to December 2015. Olin Exhibit "Objects of Zulu Colonial Period Domestic Life"
Jason, Nathan, Cailin, and Taylor prepare objects for display. 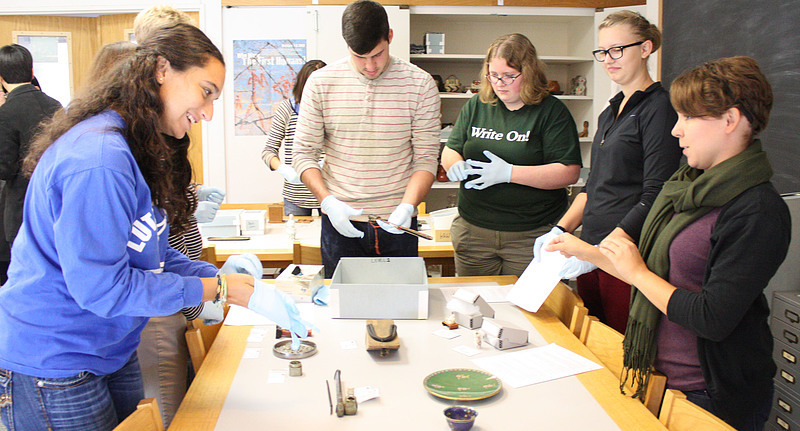 Students worked under the supervision of Dr. Crider to explore the Luther College Anthropology Ethnographic Collection of Zulu objects collected by Lutheran missionaries since the late 1800s. The items selected for research and display provide a glimpse into the daily life and practices of the Zulu during Colonialism. This unique collection allows for the examples of some domestic traditions that have persisted, such as food preparation, and those that have changed over the last century, especially in clothing. Students prepared each object for display, crafted labels and text based upon their research, and designed the layout of the exhibit. The display was available from December 2013 to December 2014. Vesterheim / Gunderson Clinic Exhibit "From Norway to America: The Functional, Symbolic, and Aesthetic Used for Wood"
Students with Alison Dwyer at Gunderson Clinic Exhibit. 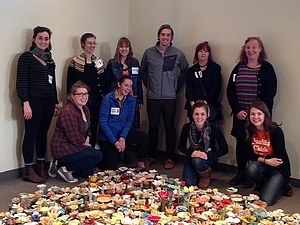 Museum Studies and Art Education students At Vesterheim Norwegian-American Museum exhibit "Flora Metamorphicae" (Spring 2014). Art Education and Museum Studies students explore the Vesterheim Norwegian-American Museum and the temporary exhibition, Flora Metamorphicae, during a visit from the Norwegian artists in Spring of 2014. Museum Studies maintained by Destiny Crider. Page last updated on 3 September 2018.